xCEEd is Central and Eastern Europe’s leading Fintech conference. This boutique conference and trade show, now in its 3rd year, core proposition is focussed on Innovation, Creation and Delivery. This is not a show that talks generally about possibilities, we take specific topics and demonstrate commercial, real life possibilities. We support this with first hand, expert experience from our speakers, panellists to help create clear “to market” pathways. xCEEd 2018 demonstrated its creative flair by being the world’s first conference with its own cryptocurrency, xCEEDium.The xCEEd app, with slick UX, clearly exhibited xCEEd’s ability to offer a commercial use for crypto while effectively showcasing the core components with clarity and ease. 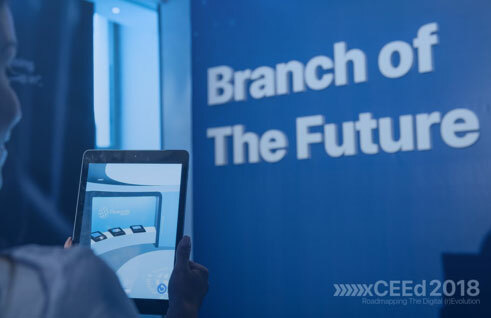 Not stopping there, xCEEd revealed a viable commercial use of AR and VR with ‘Branch of the Future” where a virtual bank branch was created. Demand for xCEEd has been expressed by both conferences being sold out quickly and the calibre of the speakers and sponsors wanting to be involved. Other regions within CEE, such as Croatia, Bulgaria, Romania and Slovenia, are interested to host xCEEd because of its winning mix of experts, content and its ability to stimulate deliverables, known as the xCEEd Effect. However, it’s Montenegro’s fintech forward mentality, cultural and consumer readiness that has created the perfect storm for xCEEd 2019 to ignite a fintech (r)evolution. xCEEd 2018 was a 2 day event with a mix of panels, workshops and speakers from all over the world with just the right mix of networking to make it one of the most effective and collaborative events of CEE. xCEEd 2018 delivered bigger and brighter than last year with new concepts from xCEEDium, the conference cryptocurrency, through the xCEEd Gift Shop, to the Augmented Reality “Branch of the Future”. xCEEd 2018 was the year for interconnectivity with the xCEEd app, an interactive communications portal for the conference which we have kept open allowing the connections made at the conference to continue to grow and prosper. “Rich in thought-provoking content, great practical insight of both local and regional fintech players, perfectly balanced speakers’ line up, outstanding workshops delivered by the industry thought leaders and practitioners. Pioneering mindset! Stay connected the xCEEd Way! Keep your app to keep in touch with other xCEEd alumni, with over 1142 delegate scans staying up to date with your cohort is even easier than before. With over 413 transactions in the xCEEd shop – were you a shopper or a saver or an earner? We had over 3017 reward scans and 939 exhibitor scans that earn delegates more xCEEDium and stimulate deleafgtes and exhibitors to interact. Any xCEEdium left in your wallet is safe and sound and will be kept available for your to enjoy some of the exciting plans xCEEd have coming up over the summer.